A couple of weeks back, on a Sunday at around 11 at night I finally started writing that story. I had been wanting to write it, get it out, for more than two years, but couldn't find time. Writing takes too much necessary time. You have to bargain with time. That night too I was bargaining with time to finish a story. I had a job to report to in the morning. It was around 2 when I laughed to myself and thought,'Can't stop now. I am never get down to writing it. May this be a long night!' The story 'Fish' finished at around 4:30. I didn't poofread it, I almost never do. Let it be 'Kehu Main Pade Khuda. Time is nothing. It is just a unit. I hit the publish button, went to sleep. Woke up at around 8:30. 'At least earlier they used to look like map of India, now they look like Antarctica.' With that I bid my mother and her Parathas good-bye. After a two and a half hour commute that included cycle-rickshaw, Auto-Rickshaw, Metro and the again Cycle-Rickshaw, I was in office where I going to stay for entire next week, tying to design a social game. Now week's days would be spent trying to understand behavior of people online, and nights would be spent bargaining with time. And on every second night, like a wound up monkey with cymbals for hand, a monkey in love with the noise he is making, [system crashes, dies, as it tries to recover, I pick up a half-read book, flip to the page with a folded top corner and read a few pages only to stop after the narrative reaches the part about lyricist Gulshan Bawra's ironic inspiration for an early 1980s Bollywood love song peppered with Kashmiri greeting, 'Kherishu, Varishu'. I want to write some more. But my system does not respond. It crashes. I return next night to finish this post from a friend's system. Like an automaton, I would religiously hit the publish button. Last week, thanks to my super vanity - a habit of self-googling, I realize 'Fish' got posted to some newspaper called kashmirmonitor [kashmirmonitor.org/krkashmirmonitor/08232011-ND-strange-tales-from-tulamula-10326.aspx]. Although my name as the author is there next to the miss-titled story, 'Strange Tales from Tulamula', no one wrote to me asking 'Hey, nice stuff, can we use it? ', No, it just got posted, filled up a space. Served what purpose? No clue. What monkey business! And what harbingers of new social change. Two nights ago, I run into more monkey business. I was going through comments section of various articles on Kashmir Current Affairs. My sorry excuse for this despicable exercise is that inspite of all my genuine efforts, I still regularly fail at entirely burying myself in Past, and sometime I too get tempted to get in touch with Present whose commentary offers us the LOLs of future. So I was digging comments. And I ended up the gallery of vintage photographs collected from "various sources" set up by an online newspaper called 'kashmirdispatch' [kashmirdispatch.com/gallery.html]. 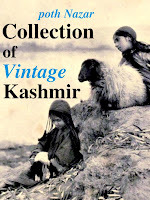 Yes, among other stuff ( some new even for me, sourced from who knows where) I saw Vintage photographs of Kashmir that I have been posting for more than two years now, with notes on dates, places, photographers and sources. That's more than 60 post with more than And I saw stuff that Man Mohan Munshi Ji posted on this blog from his personal collection, like The paperwallas just post it on their website as part of a gallery without any adjoining description. The exercise serves what purpose? 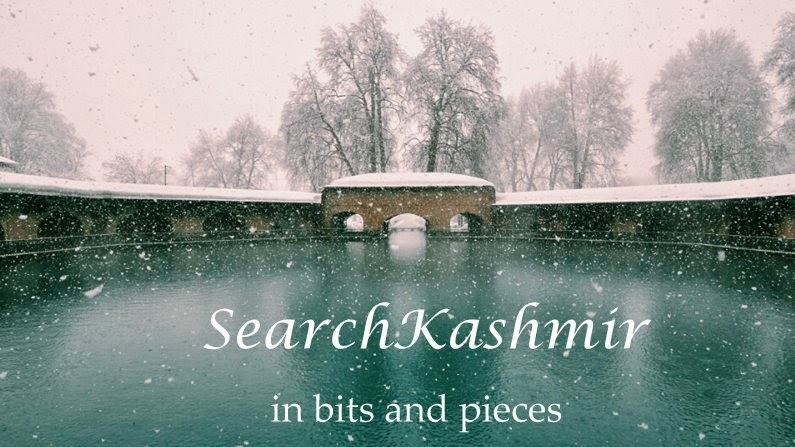 When I started posting, I could have easily put a big 'Search Kashmir' logo on all of them. But that would not have served the purpose of their existence. The fact that these photographs were shot by someone long ago, and that they were used in detailed narratives about an exotic foreign land written mostly by men (and in some cases by women) seemingly burning with a strange zeal for information, and the fact that these photographers were mostly always duly acknowledged, that these photographs were preserved for years, and only now scanned for free by billion dollar companies, that part of the story of these photographs tells us just as much about the politics of information as the manner in which we the 'subjects' now use or misuse these information. And right now I think we, in this part of the impoverished world, still don't get it. On one hand I have newspaperwallas who just Monitor and Dispatch and on other hand I have people who are kind enough to drop in a line before even posting stuff to their Facebook Walls. For people who use this blog, please feel to use use whatever you want but...try to give credit where it is due. If this post leaves you confused enjoy this video by Nina Paley. Extremely irked that KD used your pics and archives w/o so much as a by your leave and giving credit. Will raise stink on Twitter. :¦ You are most respected and admired for the brilliance you put in, Vinayak-san. Something like this is inevitable, I post these things so that they get used. But I seriously thought when someone like KD is going to use it they won't act like some adolescent kid on Facebook boasting a gallery comprised of leeched images and borrowed information. Thanks for your support and Eid Mubarak! Kherishu, Varishu. I love you, I need you!